Observations about corporate energy management from the Grid Edge World Forum. How are corporate customers -- and the vendors that serve them -- maturing in their approach to energy? From the enterprise point of view, the more important developments are behind the meter. Most enterprises operate across many utility territories and seek standardized offerings. They are looking for solutions that can collect and analyze data at a more granular level than just a whole-building smart meter. Additionally, many enterprises want access to real-time data (utility smart meters typically provide data one day after it is gathered). A few important trends stood out at GTM's Grid Edge World Forum last month: the coming consolidation, the growing diversity of delivery models, verticalization, and improved clarity in the technology stack. In any emerging market, consolidation is a sure sign of maturity. Many markets start with dozens of vendors (or more) that offer overlapping and similar products. Then markets typically consolidate into a few key players that own the majority of the market. At some point, established players in adjacent markets begin to acquire smaller firms, or some of the pure-play innovators take market share and become dominant players. In enterprise energy and building management, the acquisitions are starting, but the market still is very fragmented. There are dozens, if not hundreds, of software firms offering energy and operational efficiency solutions to enterprises. The volume of firms and complexity of offerings might delay consolidation itself; even potential acquirers could have trouble determining which firms to purchase. Additionally, some of the recent moves, such as Enel buying EnerNOC and Demand Energy, and Engie acquiring Ecova, OpTerra Energy, and Green Charge Networks, may be due to the changing role of the utility in Europe and the growth opportunities they see in the U.S. That said, these moves might act as a catalyst for other acquisitions. Companies still employ a variety of delivery models: Software only, software-plus-hardware, etc. On a related point, behind-the-meter firms still provide a mix of hardware, software and services. In some cases, an enterprise shopping for solutions may shortlist one firm that has a software- only solution and another that has built and deployed its own hardware metering system (integrated with its software). While startups with their own hardware may be considered less attractive to venture capital, especially given the VC move away from cleantech, corporations looking to make strategic investments may find innovative hardware to be an advantage. Additionally, some of the high-profile software-only firms of years past have been unsuccessful, leading new entrants to consider adding their own hardware. Examples include Clear Standards, which became SAP Carbon Impact, but was then shut down, and Hara, which is a fractional part of the Verisae offering. The hardware-plus-software firms are showing some promise. Most recently, Whisker Labs, which combines software with breaker-level metering hardware, was acquired by Earth Networks. Prior to that, Direct Energy purchased clip-on current transformer firm Panoramic Power. A variety of other market entrants have combined a unique hardware product with software. When startups first sold cloud-based energy management software at the beginning of this decade, they rarely focused on a set of core verticals and instead sold to any and all enterprises. But each building type -- from offices to hospitals to small restaurant and retail stores -- requires different features. Now, most firms are focused on one or two verticals, at least as an initial beachhead. On one panel at Grid Edge, Zen Ecosystems discussed selling a hardware-plus-software solution to retail sites that previously “just had a thermostat” that would be managed manually. The restaurant and retail building type has become more attractive recently, since few of these sites have building automation systems. Additionally, any retailer with hundreds of sites may have significant energy costs, spread across many small sites. Switch Automation also was represented on this panel and discussed its work with retail and commercial real estate. In both cases, Switch connects to the existing hardware and focuses on centralizing and analyzing all of these data streams. While this model could be applied to any building type, it makes sense to focus on buildings that don’t already have a supervisory building automation system or those that are routinely updating various systems to improve the tenant experience (commercial real estate). Smart meter deployments over the past years provide modern hardware that enables a variety of data-driven technology solutions delivered through utilities. But for enterprises that have buildings in many utility territories, this does not provide a standardized lowest common denominator. Moreover, the smart meter may not be at a granularity to help a large building optimize its energy use. Behind the meter, the challenge is to collect data consistently from many different building systems -- building automation, lighting control, interval metering and others. Then this data must be cleaned, analyzed and served up to users. Many vendors have built the whole technology stack on their own. At the same time, taking on this broad product offering creates a significant product backlog and typically leads to a lot of technical debt. Now, some companies are beginning to focus on solving just one part of this technology stack, partnering with other firms that provide complementary pieces. Tom Willie, the CEO of Blue Pillar, spoke on one panel at the Grid Edge World Forum and noted his firm’s role as the middleware for distributed energy assets -- while it does provide some visualization capabilities to end users, the firm is happy to let energy service providers and other customers deploy their own applications on its platform. Blue Pillar focuses on one part of the stack, not on delivering the whole product on its own. Given the established channels to market within building services, smaller firms may be better off helping those firms already serving an established customer base, instead of trying to take business away from them. The Blue Pillar model is likely to continue to succeed. Vendors may be less focused on owning the end-user relationship and more focused on finding the most challenging problem to solve, and being best-of-breed at addressing it. The behind-the-meter technology landscape will continue to mature and consolidate in the years ahead, but Grid Edge World Forum provided glimpses of what it will look like. There are likely to be more corporations making acquisitions or strategic investments, more firms that partner to deliver a compelling full offering, and firms that refocus their efforts on a smaller set of building types and verticals. 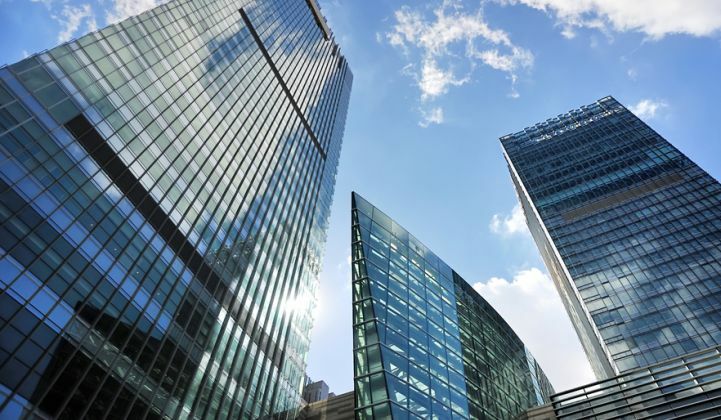 These are positive steps for building owners and operators, who will be less confused by the variety of offerings in the market, and will be able to procure deeper and more effective solutions. It’s hard to know if this is one, five or 10 years away, but the momentum is moving in the right direction. Joseph Aamidor is a senior product management consultant focused on smart buildings, IOT and energy. He helps startups and established industry players understand the smart buildings market, develop competitive strategy and forge partnerships. He previously served in senior product management roles at Lucid and Johnson Controls.